Billy Graham is an American Christian evangelist, ordained as a Southern Baptist minister, who rose to celebrity status in 1949 reaching a core constituency of white, middle-class, moderately conservative Protestants. He held large indoor and outdoor rallies; sermons were broadcast on radio and television, some still being re-broadcast today. Here is your chance to own or give as a gift his image on a JFK Kennedy Half Dollar Coin that was colorized using an Authentic Colorization Process by the Merrick Mint. The #1 leaders in coin colorization. Brilliant Uncirculated Condition. 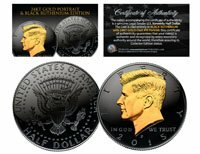 U.S. Kennedy Half Dollar Comes in air-tight acrylic coin holder.